If you haven’t spent much time in downtown Cary recently, let me tell you that you are missing out. 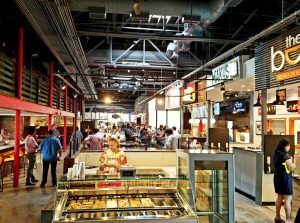 Over the past couple of years we’ve seen the addition of Bond Brothers Beer, Pizzeria Faulisi, La Farm Bakery, Annelore’s Bakery and more. 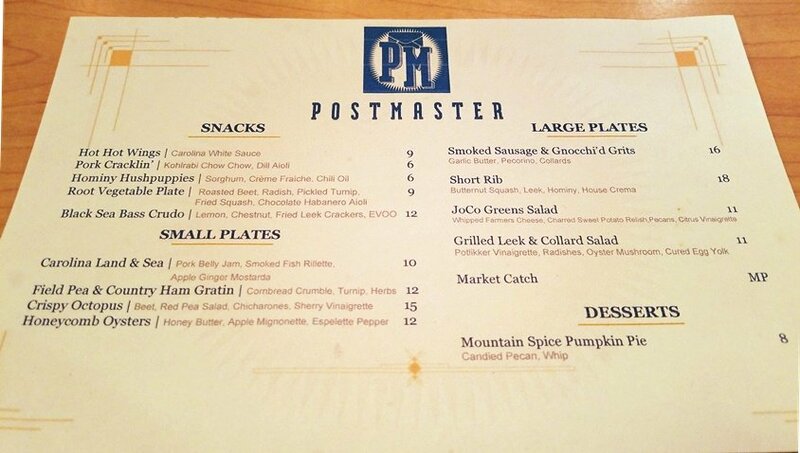 One recent and newer restaurant caught my eye, Postmaster! Located on a quieter back street (Cedar) behind the main strip on Chatham, I was curious about this modern looking space while it was under construction. Here’s what to expect when you visit! If you’re headed over to Postmaster, thankfully you’ve got plenty of parking options! Large private lot out front and also Cedar Street is an easy option for on-street parking. 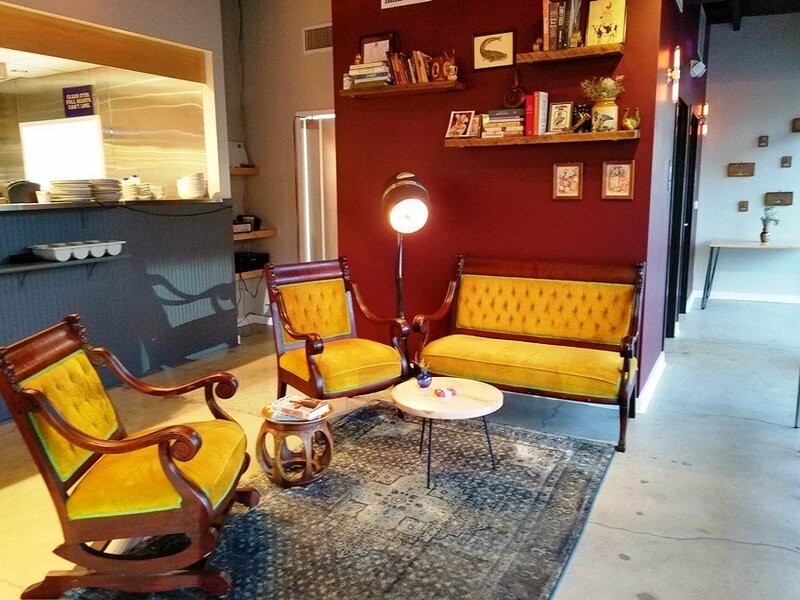 As you approach Postmaster, you’ll immediately be taken by the super-mod, Scandinavian like decor. The front face is primarily plate glass windows with a natural wood facing above along with some mirrored panels. It all looks very light, bright and open! At night, the Postmaster glows with anticipation on this street corner. Now will the dining experience match up with the initial impressions?! 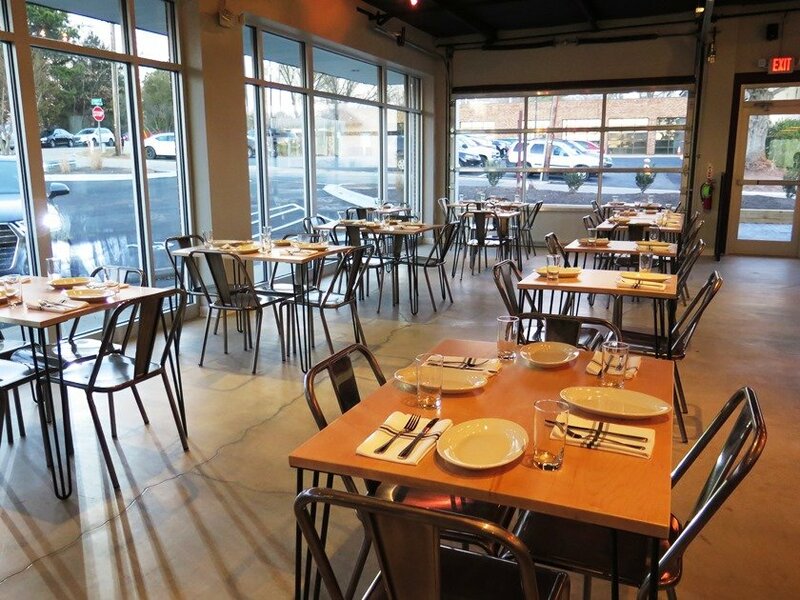 Poke your head inside and you’ll be struck by how minimalistic and hip the space is, quite different than what you’d usually find in downtown Cary. 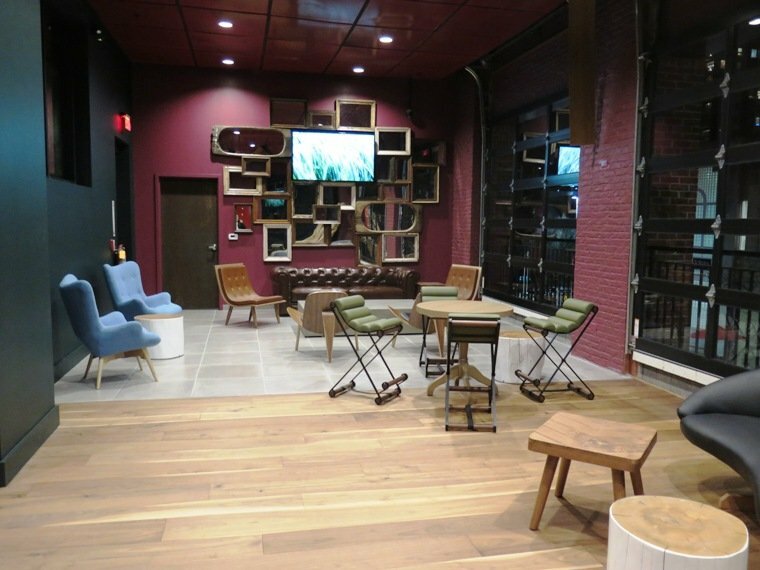 Bare concrete floor with simple wood-top tables and metal-framed chairs. The back bar is where things get interesting! 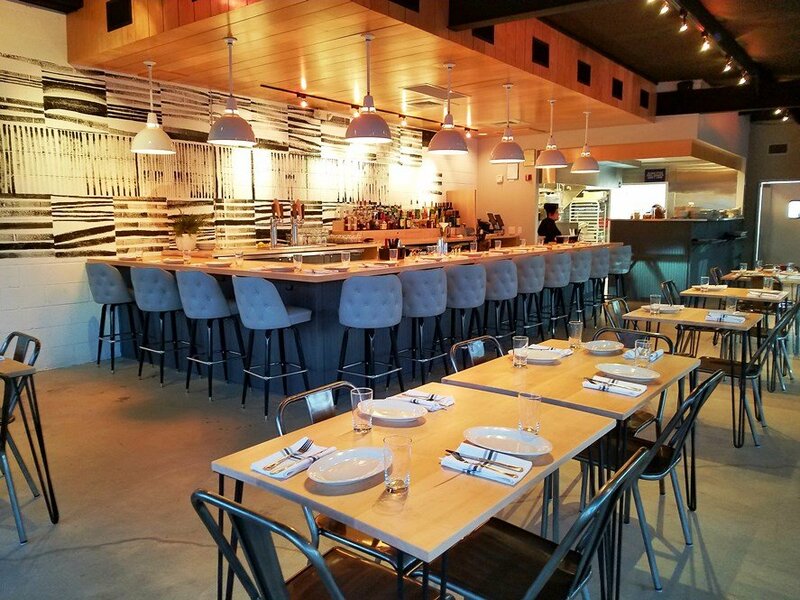 A modern graphic print wall sits behind a bar lined with button-tufted fabric chairs. They obviously spent some time and money on the interior design at Postmaster. A small, open kitchen in the back-right corner is where all the culinary magic is handled. Go over the seasonal menu and you’ll be entertained by a selection of cocktails and beers along with food items to match. 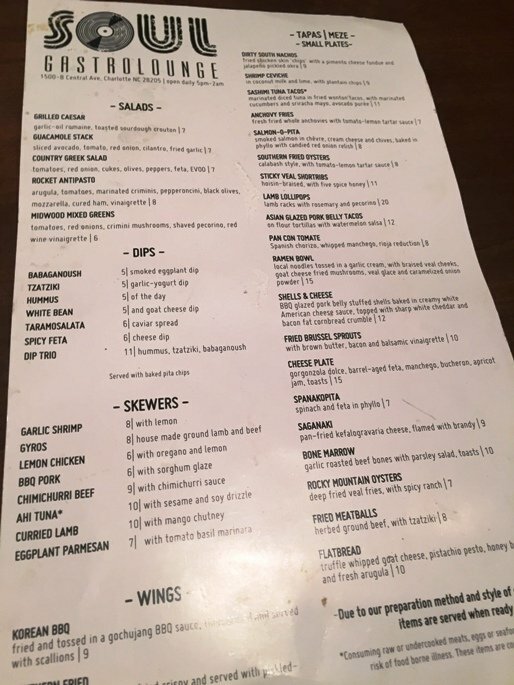 The dinner menu covers snacks, small plates and large plates running from $6 to $18 similar to Humble Pie in Raleigh. And given the seasonality of their menu, details are on their website but you’ll have to stop in to find out what’s being served for the evening. 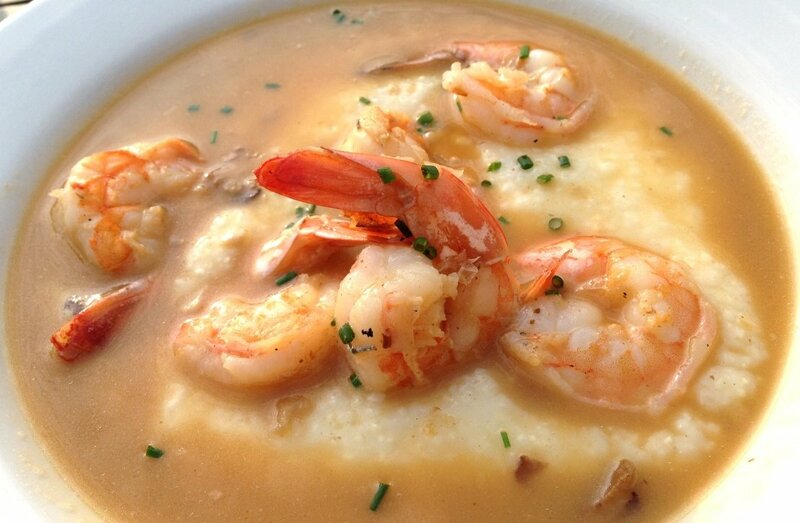 The cuisine is primarily modern Southern with a gourmet twist. 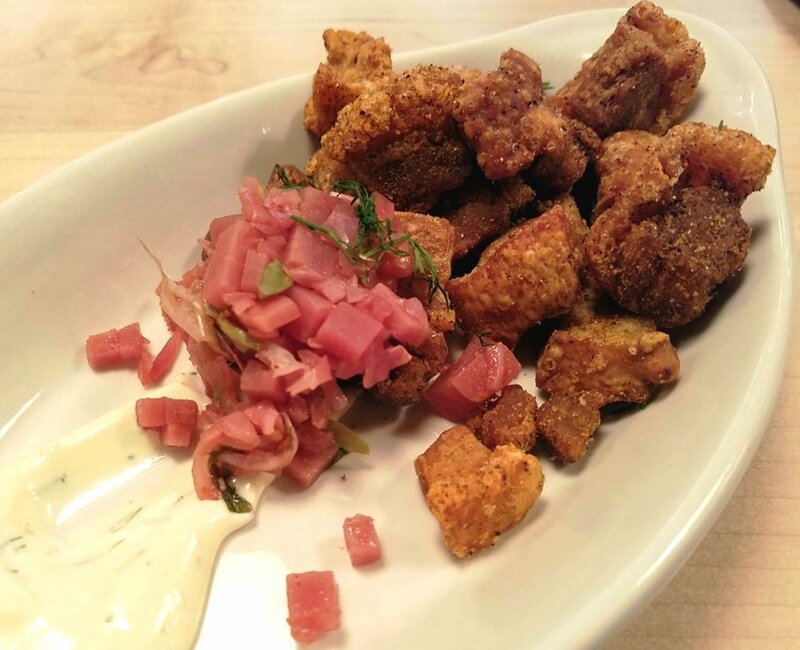 For starters, I’ve tried the pork cracklin’ app ($6) which is served with chow-chow and dill aioli. An interesting and unconventional combination of flavors. The cracklins are nicely fried but a bit drier than expected. On another visit I try some spiral-cut potato chips served up with a Texas Pete aioli. This is a fun little dish that screams sophisticated State Fair fare! 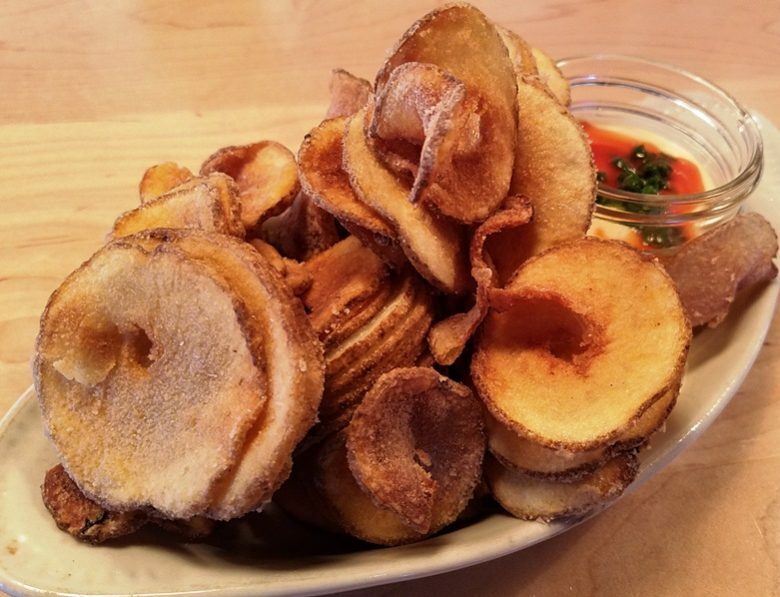 The chips are thick and crisp on the outside, but a bit raw on the insides. I like the concept but it feel like this appetizer could have been improved. A grilled elote corn covered in parmesan cheese and green goddess dressing is on the menu for one visit. Split in half, it’s a messy but tasty treat to be shared amongst two people. I also enjoyed some nicely grilled lamb lollipops that were cooked a nice medium and covered in a good sear, thumbs up here. Overall I think there’s a lot of creativity and diversity in the Postmaster menu but some inconsistencies. Be aware that the menu changes pretty frequently so if you like a dish, it may or may not be available the next time you visit! For the large dishes, the prices go up quite a bit to the $15 to low $20 range. I’ve had the chance to try a couple and again, Postmaster’s creativity shows up. 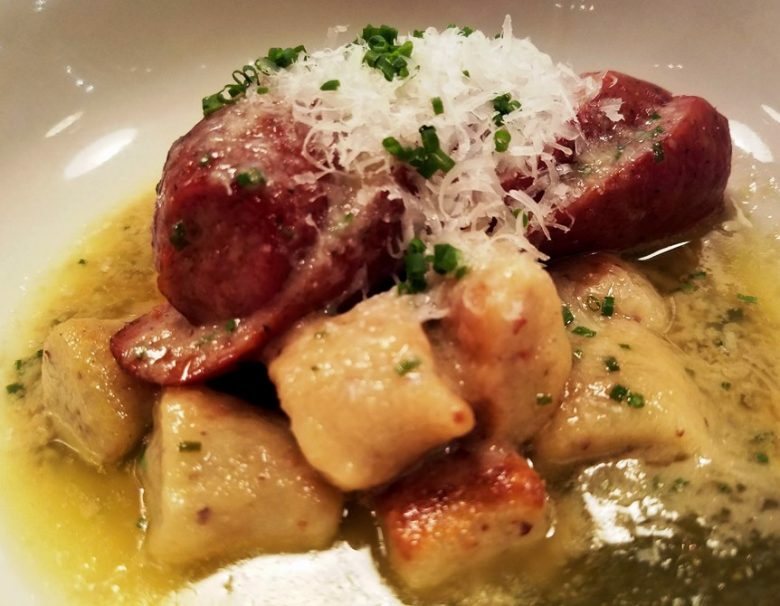 A gnocchi’d grits with sausage is a tasty take, mixing up Italian and Southern cuisine. The texture of the gnocchi is excellent with some toothsome chew but I found the sauce to be a bit heavy for the dish. 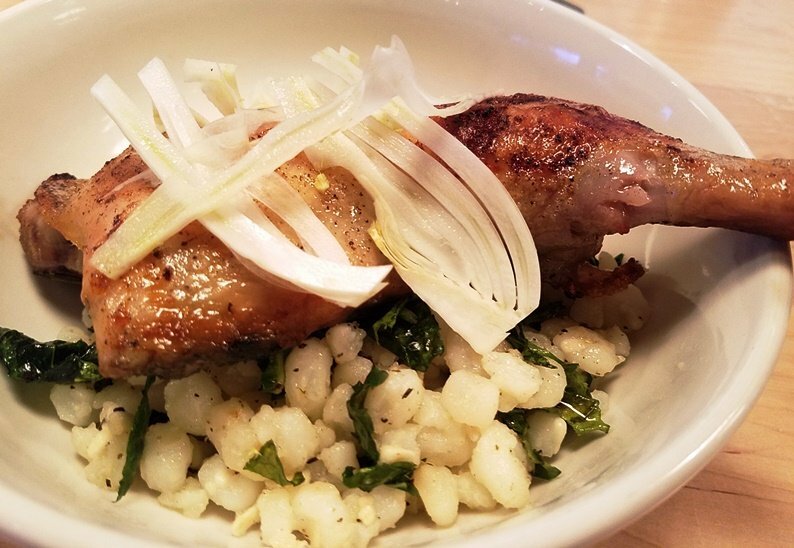 The smoked chicken on hominy utilizes a less common Southern ingredient. Hominy is a type of corn which has a softer, puffy texture and acts as a good base of carbs for this dish. It is again, an interesting play on a classic Southern dish. And over the course of my visits to Postmaster I’ve found the service to be good but a bit casual. It’s a large open space so you can see everything that’s going on in the dining room and kitchen. If I had any advice to diners coming to Postmaster it would be to do some cocktails and small plates but I’m less certain about doing a full meal with the larger plates. 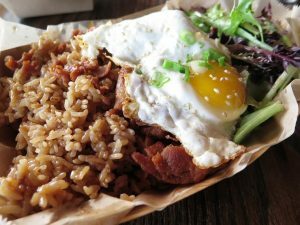 There’s still a bit of inconsistency in the menu and once you start paying more money for those large dishes, it’s hard to overlook the misses. But I think the Postmaster certainly has potential. From decor to concept and creativity, it’s certainly trying with its menu. I’m just hoping it settles down a bit and delivers a more consistent dining experience given the prices, expectations and great decor. So let’s just say that for now, the Postmaster is a work in progress for the Cary food scene! 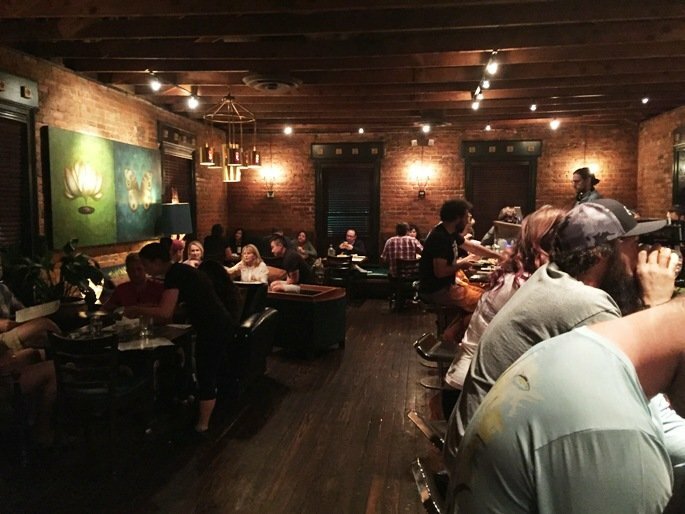 Over on S. Glenwood Avenue in Raleigh, you’ll find a plethora of bars and clubs but surprisingly, not nearly as much in the way of restaurants. So it was with great curiosity as I watched a restaurant over in the 500 block of the street get built out over the past several months. 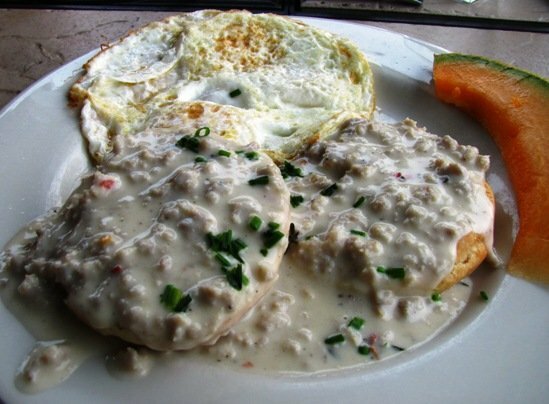 I’m in the area frequently and the one thing I knew for certain was that it was going to be fancy and upscale! 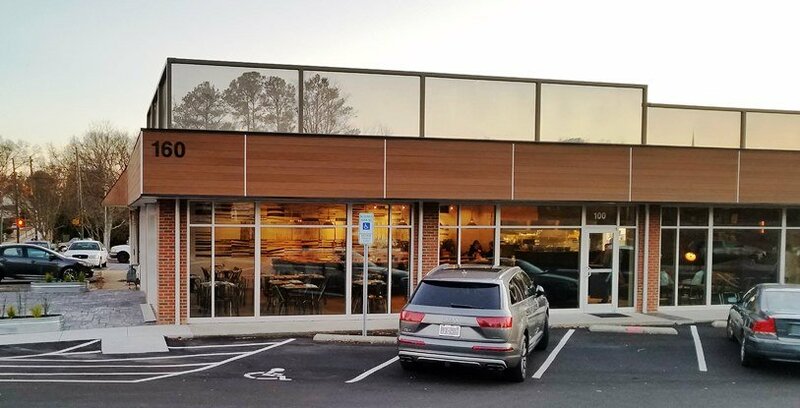 Eventually I uncovered that this new restaurant on S. Glenwood would be a wine and small plates affair and part of the expanding LM Restaurant Group famous for Carolina Ale House and Taverna Agora. Construction finished up at Vidrio in January of 2016 and I was finally able to go in for a couple of visits as a media person. 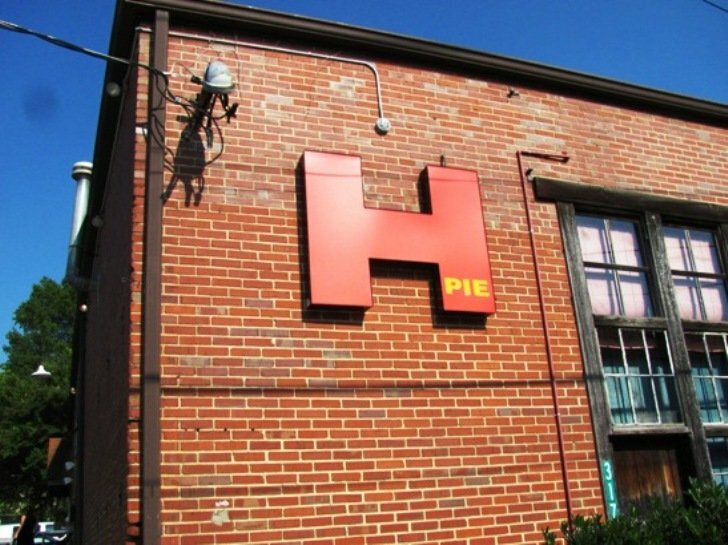 If you’re curious about the newest restaurant in the S. Glenwood neighborhood, here’s what to expect! As you approach Vidrio you quickly realize that’s it’s a fairly upscale spot given the valet stand up front. S. Glenwood can be a bit tough for parking so it’s a nice touch and a hint of what’s about to come. A gurgling blue tiled pool greets you at the entrance of Vidio and inside I was met by a trio of hostesses up front. The place smells great with its wood-fired ovens and it’s bustling for a pre-opening event. I meet up with the LM marketing representative, Kat and we start to tour the space. Facing the street-side of Vidrio, you’ll find a funky, modern space full of textures and patterns. 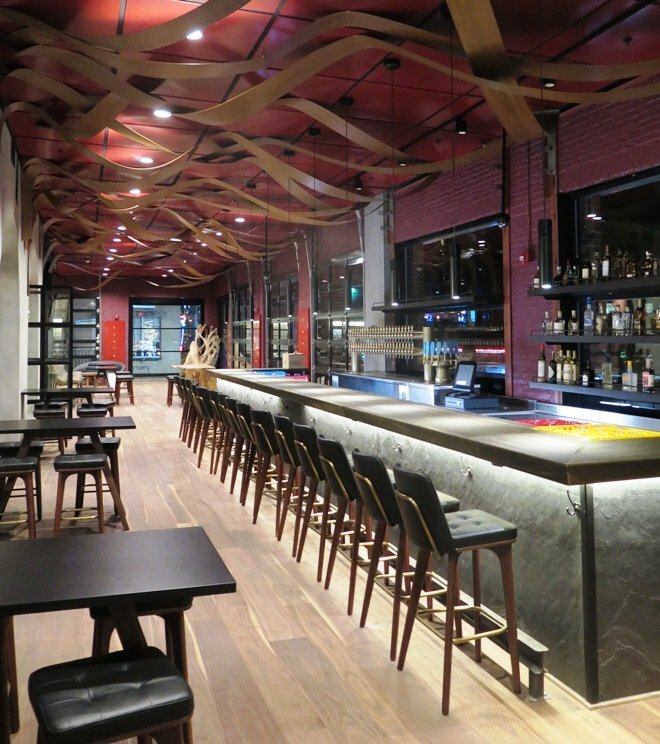 Wood rods hang over the bar along with metal caged lamps in the seating area. A great spot to see and be seen off of Glenwood Avenue. We then move upstairs to Vidrio’s second floor and I’m not sure what to expect here! Kat shows me through Vidrio’s private dining areas which includes a brightly colored area and more subtly decorated banquet room (white-brown) which would be great for a wedding, party or special affair. 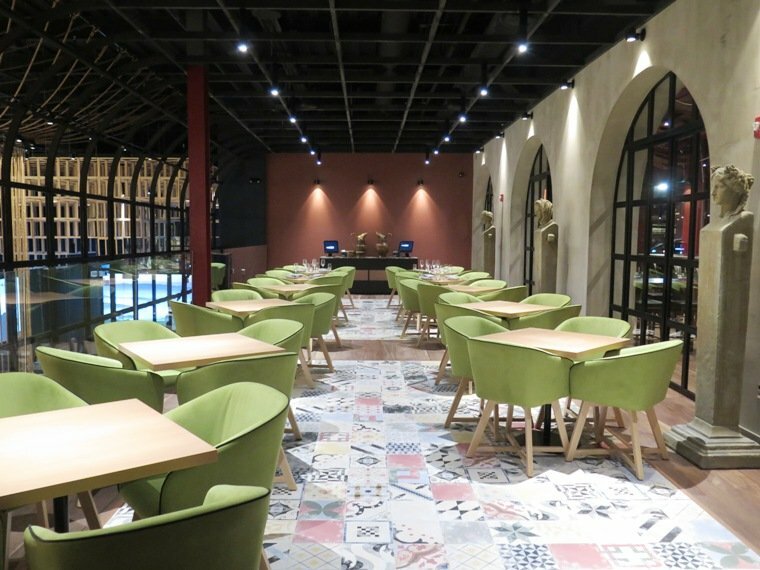 But throughout all of Vidrio, the decor is done in a colorful and tasteful style, quite unique for the area. We then check out the upstairs bar and lounge which is similar to the downstairs bar but sports sensuous, bent wood above, roll-up garage doors and some extra space. Vidrio is still figuring out details for this space but it will most likely be serving small plates and 50 wines on tap (350 bottled). But it’s a great looking spot, curious to see what they end up doing here. 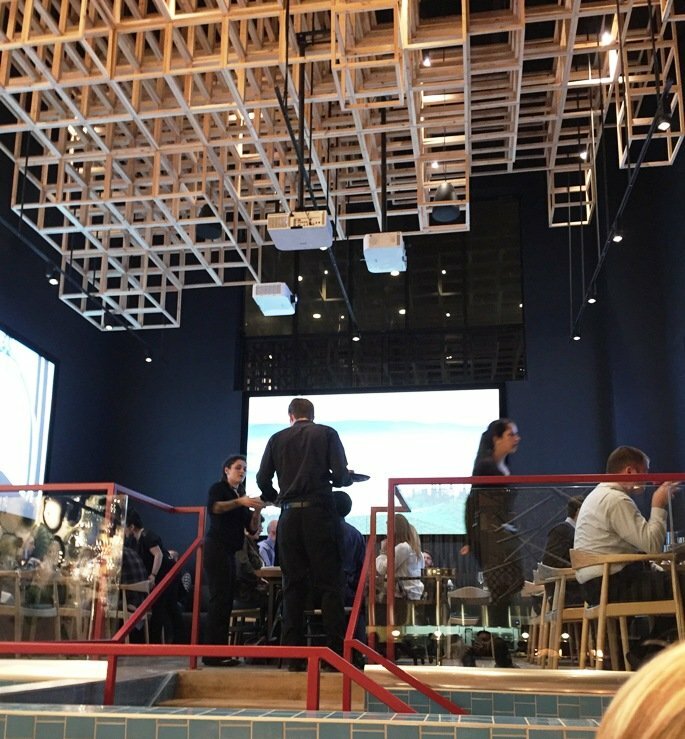 And while my first visit to Vidrio was just a tour of the space, I was able to get back for a media dinner which gives me a pretty good idea of the cuisine here. 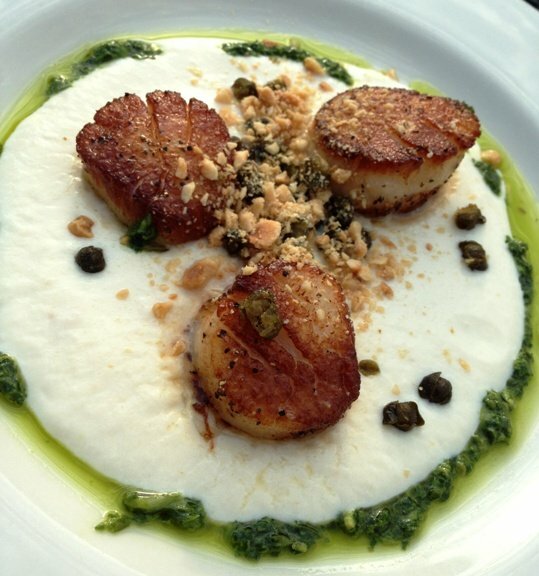 It’s Mediterranean-style small plates that focuses heavily on fresh ingredients and the grill. Everything I tasted was well prepared and lightly seasoned, I’ll come back for a second visit before doing a final review of Vidrio. It’s still a bit early for them and they’re still in new restaurant shake-down mode. 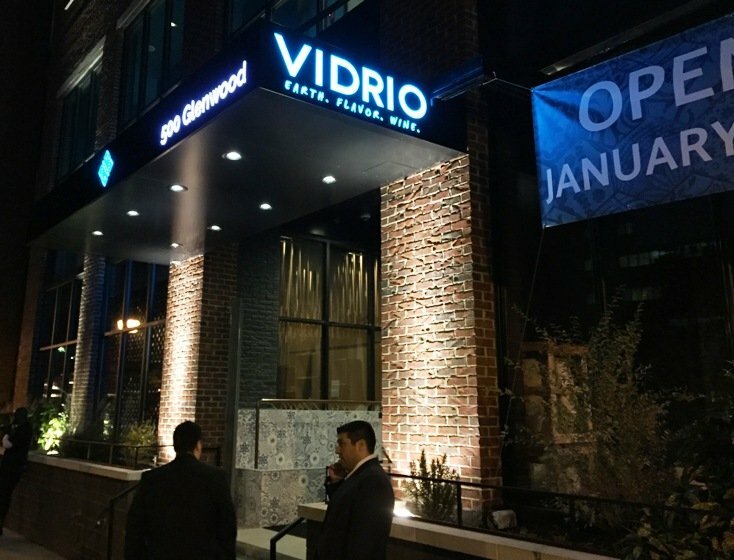 So welcome to the neighborhood and welcome to the S. Glenwood party, Vidrio! 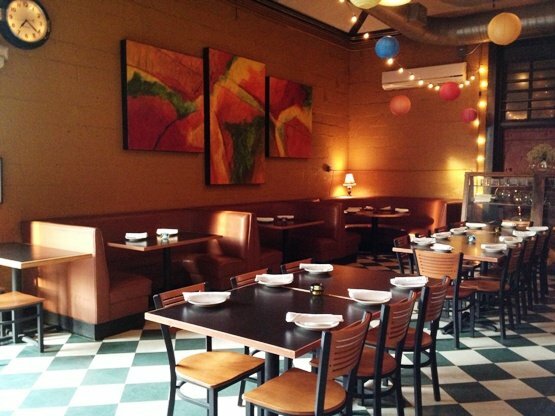 Your space and decor are unmatched in the area for dining rooms and you’ve got an ambitious menu on tap. 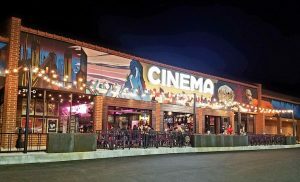 If you’re looking for a good date spot or private party, you should definitely stop in for a visit and check out their space and menu. Downtown Raleigh has been booming of late. I remember when City Plaza was still boarded up and under construction but since it’s been opened up, it’s been a bonanza of restaurants, apartments and more. 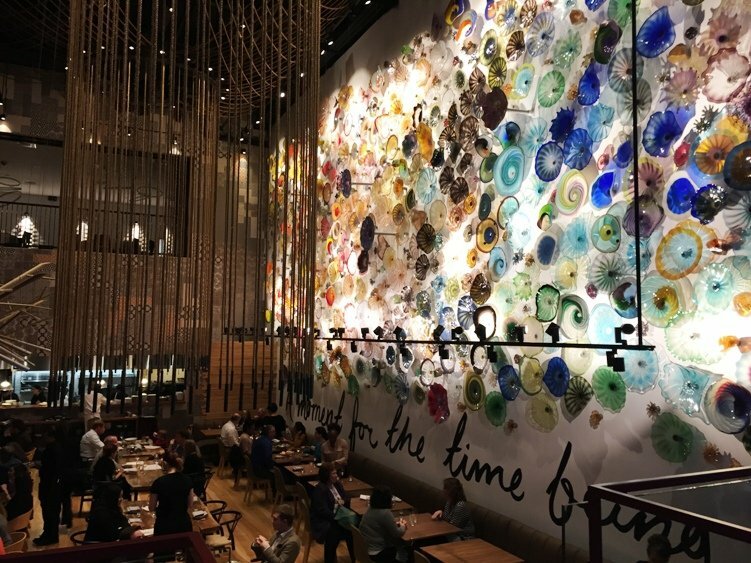 One restaurant that quietly slipped beneath my foodie radar was ORO. While it’s been open for at least 3 or 4 years, it seemed a bit fancy and had a very low-profile in my food network. But a recent change in chefs had me curious. 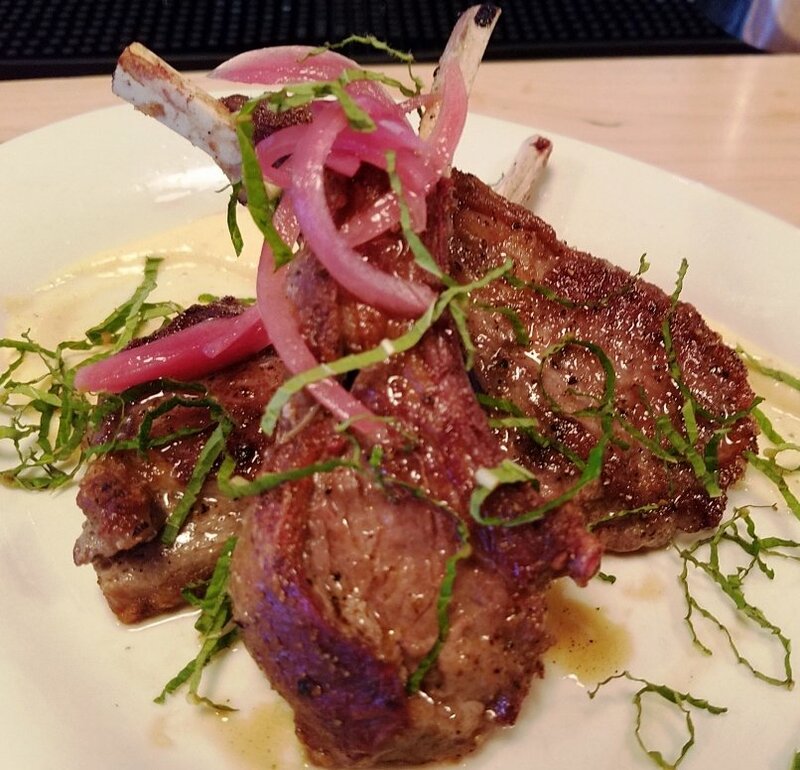 Chef Steve Zanini (formerly from Jimmy V’s and Faire) took over the kitchen in early summer so I decided to stop in and check ORO out! 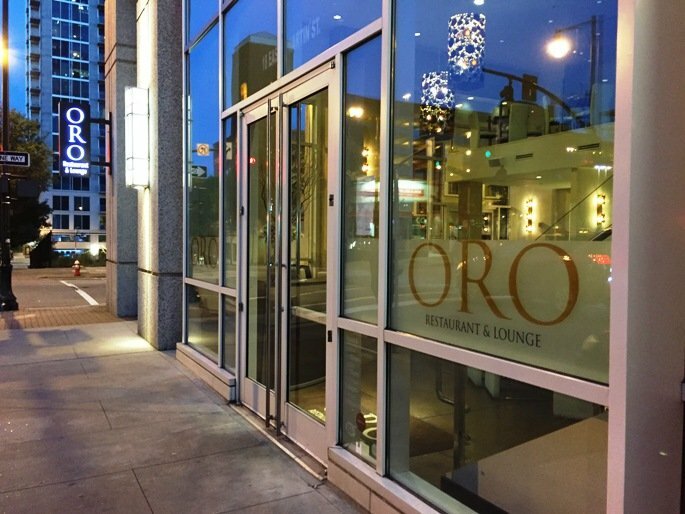 From the outside, ORO presents a beautiful face with large pane glass windows and a great corner location on Martin and Wilmington Street. 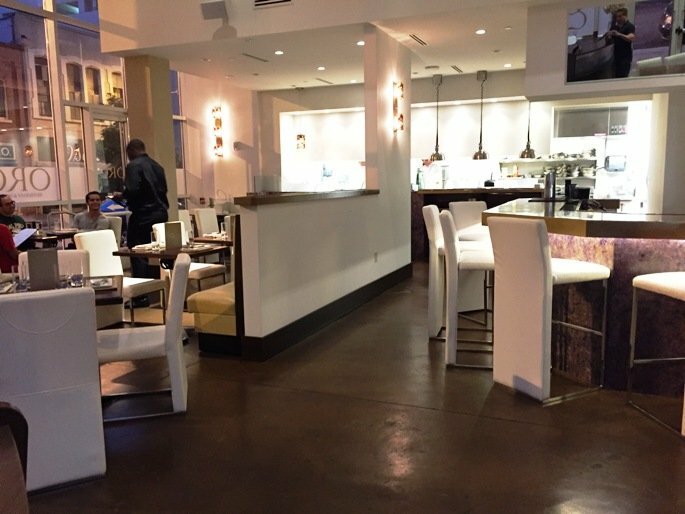 Inside, ORO’s decor is upscale and somewhat frou-frou, there’s lots of white and a wide open space. A small landing on the 2nd floor offers up a second option for seating above the main dining room. ORO had extended their Restaurant Week menu so we were here to sample their 3-course dinner off of a fixed menu. But a quick look at their menu shows a small plate focus on American classics with a twist. Most plates are in the $10 to $20 range which is reasonably priced for the decor and ambiance. Chef Steve is still working on switching up the menu so expect more changes soon! For my 3-course prix fixe I’m going with the pork belly skewers, short ribs and chocolate ganache. While we’re waiting for the first course, I take in the dining room a bit. It’s nicely appointed and feels a bit luxe but not too fancy. The closest comparison I would have is Revolution out in Durham and to be honest with you it’s an accurate comparison since they both do small plates. 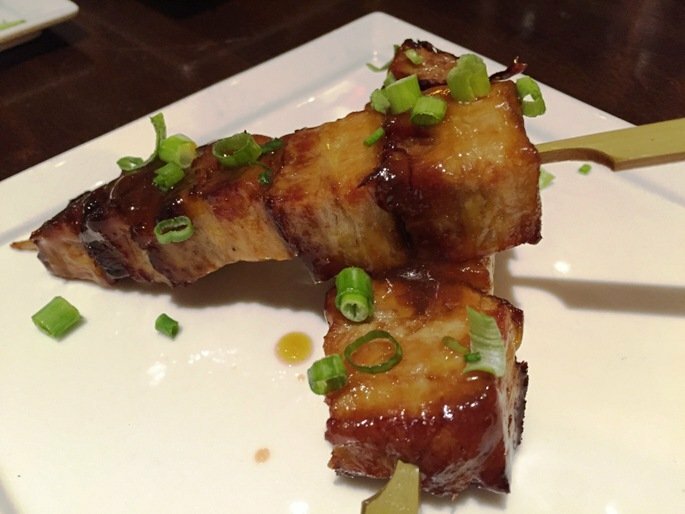 Our appetizers show up and I’ve got two skewers of pork belly which are nicely seared and browned. The pork belly is perfectly cooked with a bit of sweetened crust on the outside. 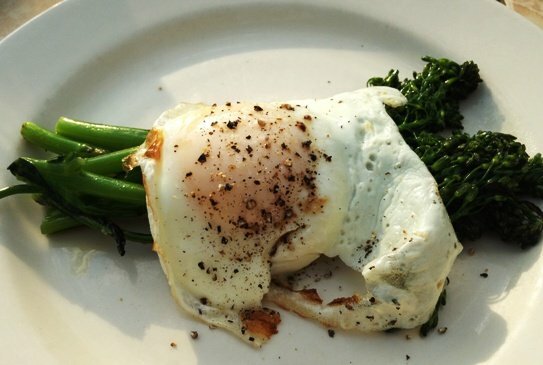 The luscious fat in this dish means that the smaller portion is just about right. 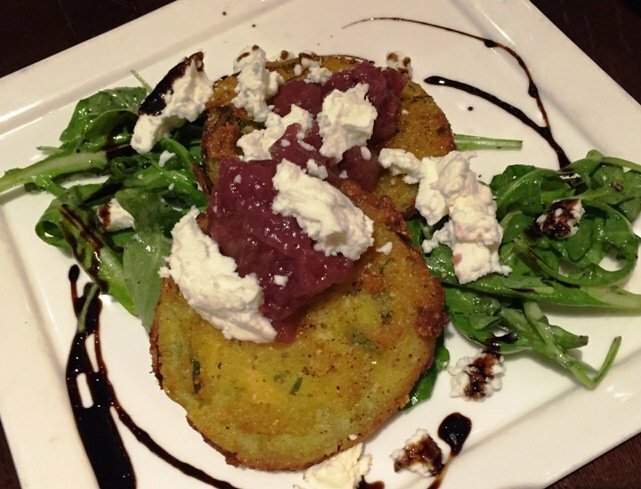 My tablemate’s fried green tomatoes are excellent served up with some goat cheese and chutney. Nice start, ORO! Next are our mains and my BEAUTIFUL looking short rib dish. I have a lovely portion of beef sitting atop some very creamy risotto. Sitting in a light pool of broth and decorated with some green beans, it makes for some great eye candy. 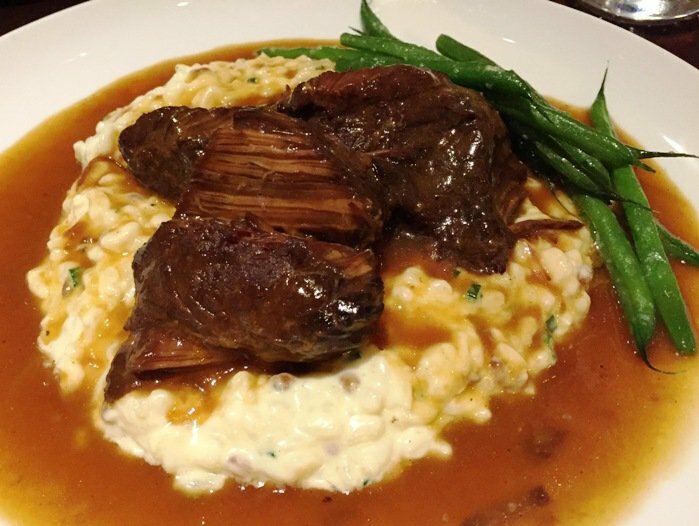 My first bite into the dish and I get an eye-roll; the beef is fork-tender and perfectly flavored. Paired up with the toothsome risotto we’re talking about a hearty, down-home dish but raised up to a special level for the tastebuds. And finally dessert. 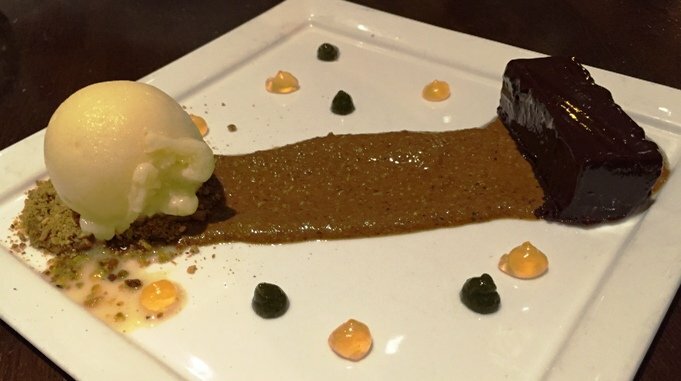 Another lovely plating job here, the ganache is presented in a shiny rectangle on top of pistachio butter and set off with a scoop of passion fruit sorbet. Dots of fruit gastrique adorn the square plate and there’s a lot of flavors working in your mouth with each bite. Rich dark, creamy chocolate with the clean, tangy punch of the passion fruit plays with your taste buds. Very nice job here, Chef Steve. 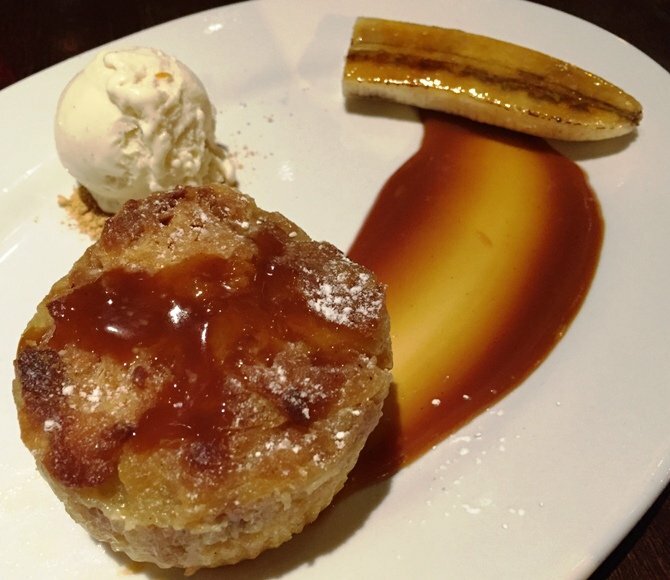 The banana bread pudding next to me looks pretty darn good but I hold back on sneaking a bite! 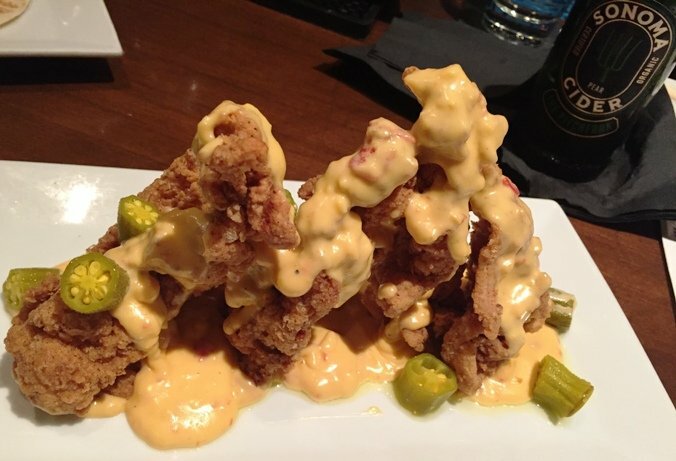 Located on Central Avenue in downtown Charlotte, Soul Gastrolounge is not an easy find. 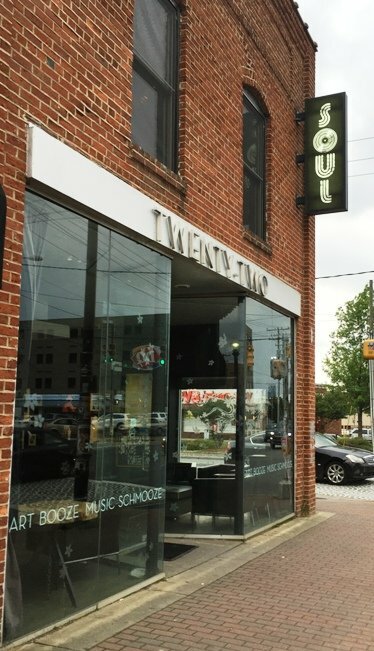 I spy a small sign above for Soul but a peek into the 1st floor shows off a quiet art gallery. I poke my head around the corner and notice some folks headed up a steel set of stairs to the 2nd floor in back. That’s gotta be it, right? At the top of the stair are a handful of outdoor diners, I pull the door open and wham: this must be Soul Gastrolounge! The place is hopping with a bar in front, couches to the left and booths to the right. It’s an odd little set-up with worn woods and a mix of styles and art. Even on a Sunday night it looks like I’ll have to wait a bit but finally a seat opens up at the bar after 15 – 20 minutes. The bartender is good and spots the new diner immediately. I grab a cider to get my dinner going and peer through the menu. 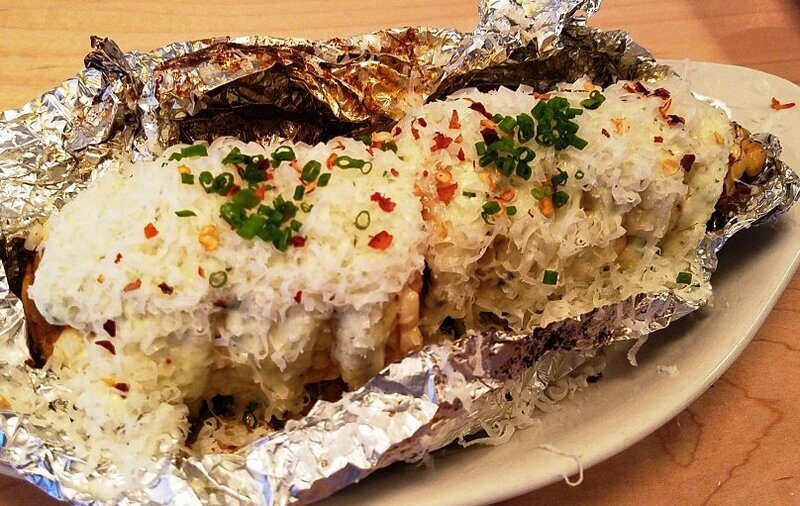 It’s a mix of funky Southern plates along with some Asian influences like sushi and ramen, alright! I love the oddities and twists they have here so I order up three plates which I’m about to learn, is far too much for one diner. 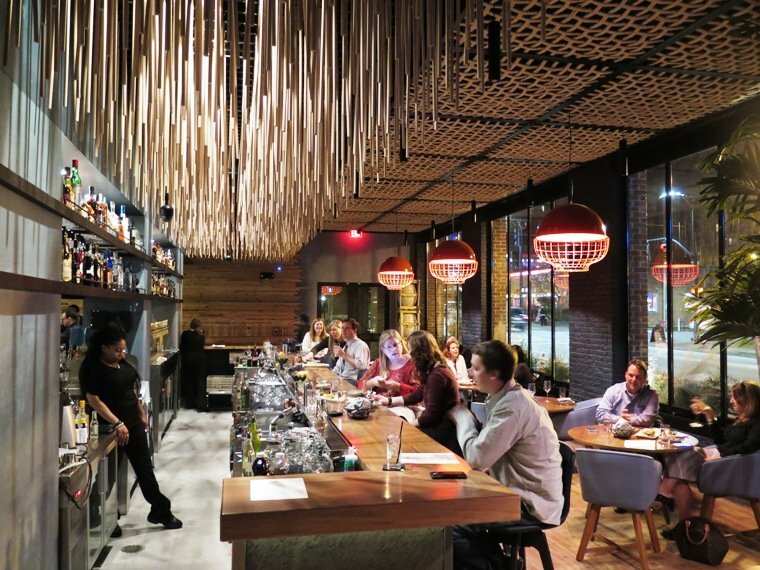 The scene at the bar is hopping with people waiting for tables and others noshing casually, Soul Gastrolounge is definitely a popular spot with a cast of regulars. 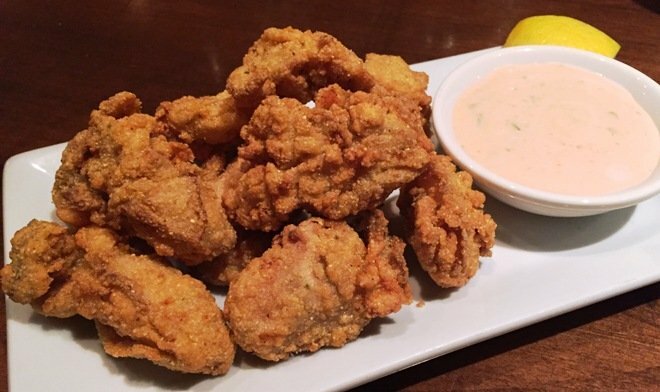 My fried oysters come out first and they look fantastic! Perfectly browned with a nice crust and dense, plump oysters. Dipped into the thousand island type sauce, it’s a great and filling starter. Next up is Soul Gastrolounge’s popular pork belly tacos with watermelon salsa! 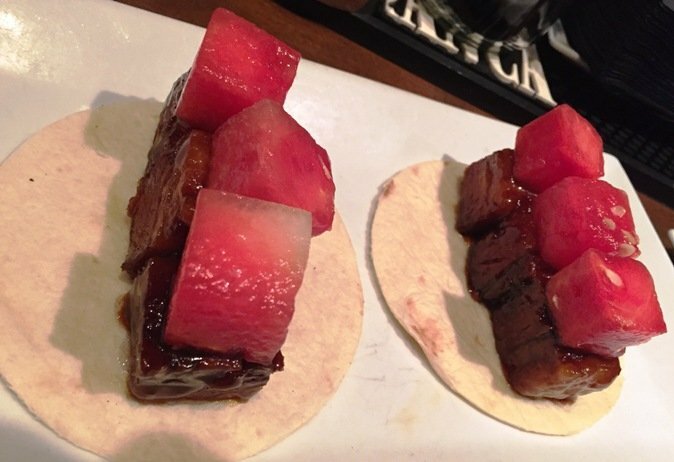 But we’re actually talking about braised pork belly cubes with a square of watermelon atop, cool… The pork belly is glazed in a sweet sauce which goes well against the rich pork and the watermelon provides some relief from all the meaty calories here. Tasty stuff but a bit tricky to eat without making a mess, oh well! I’m ready to pass out at this point of the meal but Soul Gastrolounge is still hopping. But color me impressed! Great ambiance, great service, reasonably priced creative food, it hits all the points that I look for in a new restaurant. And while the scene may not be exactly for me, most people should enjoy what’s going down at Soul Gastrolounge. Just look for that hoppin’ spot up on the 2nd floor, my friends!